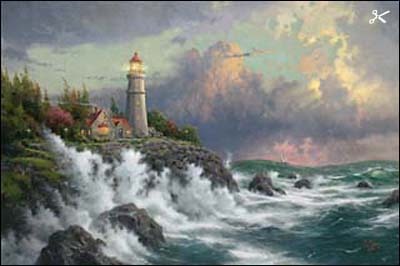 "In Conquering the Storms , I confront images of God's awesome power: lighting, storm clouds, driving winds, pounding surf. Here in truth, is a storm that can shake us to the core of our being. And yet, if we hold onto the rock of our faith, we can ride out any storm. Conquering the Storms is a parable in paint, an inspired affirmation of the great gift of faith, which allows us to accept the power of God as a source of strength." 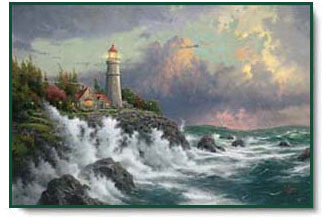 Conquering the Storms copyright© 1999 by Thomas Kinkade is prohibited from being copied.